In May, I had the chance to interview Dave Cool from Bandzoogle. He mentioned that search engine optimization (or SEO) is a topic that seems to be coming up altogether too often among musicians. In response to his comment, I mentioned that I wrote a post called Does Search Engine Optimization Really Matter? In it, I concluded that musicians should be more focused on their creative work than SEO. If you’re a businessperson (or a musician entrepreneur), then it’s something you absolutely need to be aware of, but it doesn’t mean you need to dedicate your life to it. And trust me when I say that there are professionals who dedicate their life to it. Dave and I are essentially on the same page here. SEO might be something to look into when you’re getting your website set up, or if you’re planning on blogging to promote your music. Other than that, a set and forget approach is probably the best way to handle it. In 2011, I published a post called Thing 13: SEO – My top 10 Tips. These tips actually come from Andrew Dubber, the author of The 20 Things You Must Know About Music Online, but because I felt every musician should read it, I did a little bit of a recap on every chapter a few years back. Anyway, while the aforementioned eBook has been around for quite a while, the tips within are still just as relevant today as they were back then. So let’s examine these 10 tips from a modern-day perspective. Dubber’s first tip was to take advantage of meta tags. Google has actually been saying that keywords inside meta tags do not factor into web rankings for a long time. However, the three components Dubber mentioned were: titles, descriptions, and keywords. Even if keywords don’t matter, titles and descriptions still do. Crafting effective headlines (containing relevant keywords) should be a part of your strategy, especially if you plan on blogging. Dubber’s second point was that Google pays attention to bolded text, italicized text, bullet points, and HTML header tags. This still appears to be true, but in general, formatting should be used to draw attention to important points, and to split up your content into relevant sections. Number three – link to similar sites. When you do this, Google has an easier time understanding what your site is about. I can’t confirm or deny the effectiveness of this tactic, but it makes good logical sense. The next tip is to create a sitemap for your website. This is a page where your visitors can get an at-a-glance look at the various sections and pages on your site. This helps with navigation, and it’s also good for SEO purposes. Sitemaps are still very relevant in Google’s eyes today. Tip number five is to get inbound links. It seems like this is getting talked about more than ever, so it’s obviously important. The tricky part is in getting those links. You can initiate backlinking campaigns to increase your link count, but musicians shouldn’t be focused on that. A better approach is to build relationships with your fans and industry people. If there’s a reason to talk about you on their blog or website, they will link to you. Dubber’s sixth tip is to create content. Considering the growing fixation on content marketing, I don’t think I have to say much about this. In general, the more words you have on your website, the better it is for search. This doesn’t mean you should artificially inflate your word count (you’ll get penalized), but it does mean that having a lot of content can make you more discoverable in search. Dubber’s seventh tip is to choose your keywords well. He says this isn’t so much about using paid tools to discover keywords that you can rank for, but rather a matter of anticipating what your visitors are likely to be looking for. Easier said than done in, but the general sentiment remains true. Tip number eight is to keep your website updated. This is still very important, because Google tends to give more juice to sites that are regularly updated. Having a blog can really help with this. Dubber’s ninth tip is to use Flash and scripts in moderation. Again, you can see how this could affect both your visitor experience and search rankings. These components basically do nothing for your SEO. Dubber’s final tip is to hold onto your domain name. The longer your site has been around, the more Google tends to trust it. The only tips that are less relevant or in some ways inconsistent with today’s SEO best practices are tip one and three. Even then, they’re not completely void of value. If there’s anything to add, it would be that there is a growing user base of mobile device users. As such, your website needs to be mobile-friendly. At the end of the day, I would encourage you not to spend too much time studying or worrying about any of these things. If you’re going to put any effort into SEO, do it when you’re first getting your website or blog ready. Understand what it means to write SEO-friendly blog posts. Rest assured, if you don’t have the right resources, if you don’t have a team of people working on SEO initiatives around the clock, if you can’t afford to hire an SEO company, you can’t do it all on your own. Even I have only been able to increase my search traffic by small amounts through dedicated, consistent effort. 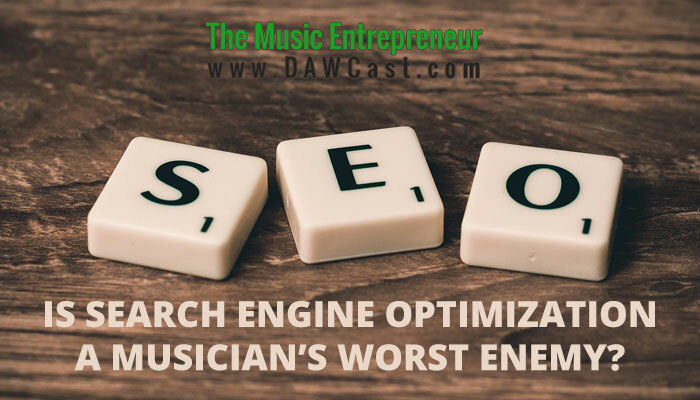 Is Search Engine Optimization a musician’s worst enemy? Well, only if you make it so. When it comes right down to it, you only need to know a few things. If you have a unique band name, ranking for that name should be pretty straightforward. You can’t dedicate eight hours per day to your SEO, so don’t. Rather, create strategic partnerships and continue to focus on your marketing. SEO can be a small part of your marketing plan, but you’re going to have a much easier time getting results with live performances, social media, radio, and other great tools.